I honestly have no idea who is reading this nonsense. My assumption is that the majority of you are not boaters. Since that is my assumption and no one is speaking up to tell me otherwise, I am going to give you a quick lesson on what could be the 2 greatest things about boating in the Northwest. The first of these 2 greatest things is the “Raft-Up”. The official definition of the “Raft-Up” has never made it into Webster's Dictionary for some odd reason, so it has become my duty as a Northwest sailor to enlighten the rest of the world. Here you go...and remember, this is an official definition from me, not Webster's. Raft-Up: to anchor multiple boats in a calm bay, tying them together, whereby making a raft. Yep, that about sums it up. There are some nuances that aren't made very clear in the official definition so this has also become my duty to enlighten the rest of the world on some very important facts that make a successful raft-up. Every once in a while my meager brain has a hard time remembering things. You might be surprised by this because I probably seem overly brilliant. It's true, I am. But even with my brilliance, I sometimes forget simple words. Usually when such a word is forgotten, my brain digs into it's built in thesaurus and comes up with another equally fitting word to describe whatever it is I'm talking about and all in the world seems right again. Sometimes in our family, the new word that was just used becomes the permanent way to describe whatever I was trying to describe in the first place. Case in point...connectors. There is a body part that is smack dab between your foot and your shin. Right now I am pointing to it, so if you were here, you would know exactly what I am talking about. You may not need the finger pointing to deduce that what I am talking about is an ankle. About a week ago, I mistakenly requested a little excitement. I had mentioned that this bit of sailing through the San Juan's that we were doing was just a little too easy. I think that I had mentioned the weather was mostly benign, so we really don't have to even check the reports. I think I even went so far as to ask for someone to send up a little squall to liven things up for us. Whoever sent up the wind and the waves, I take it back. I'm sorry. It was a joke. Enough already. Maybe you could leave us some of the wind and waves but take a good solid 20 knots off the top and we'll call things great. Or better yet, if you feel like you want to leave us with the wind and the waves, just leave them for daylight hours. Take them back at night and for God Sake's, let us sleep. We've now been back on the boat for almost a month. 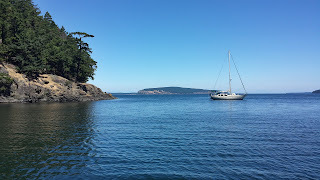 In the past month we've only covered 130 miles while zig-zagging back and forth between the San Juan Islands. Last summer we had single days where we covered more ground than we have covered in a whole month this summer. Not much water has passed under our keel. It's almost embarrassing. My guess is that we are doing what most people do on a vacation. We've been relaxing. It's not something that we are used to. I can't remember the last time we just hung out. 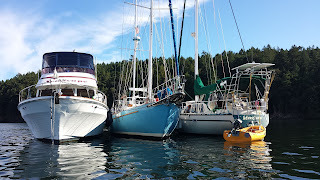 We've actually sat on our boat in a beautiful anchorage for an entire day. Yep... we sat on our butts for an entire day while relaxing and admiring the scenery and working on our tans...it's ridiculous. If you have just read the title of this posting, you are probably thinking that I am going to write something about our great country or quite possibly the 4th of July. Well, you are wrong. This little bit of nonsense has to do with a text that my brother sent me a couple of weeks ago asking for pictures of what freedom looks like. I'm sure he was knee deep in the daily grind and wanted to have a little day dream of what it's like to not have a care in the world, so of course I texted back a picture of exactly what we were looking at. 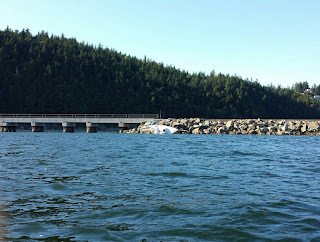 We had just rowed our dinghy to shore and were staring back at our boat that was anchored in a beautiful bay. Freedom is a wonderful thing, and for us, it comes in many forms.